Sophia’s 2 year old birthday was last week. One of her favourite presents was the Little Tykes My First Slide. Like many 2 year olds, Sophia loves things that are familiar to her. She wasn’t too impressed when the slide first arrived, whereas her 2 year old cousin immediately spent a full half hour using the slide over and over again. Within a couple of days, Sophia was used to the slide being there and discovered how much she loves it! Now she has several sessions a day on the slide and it keeps her entertained as well as being good exercise (better than watching In the Night Garden or Peppa Pig AGAIN on TV…). Most children’s slides are too big for 2 year olds, but this one is ideal. It’s just the right size for a 2 year old and although Sophia isn’t confident with going up steps on her own, she loves going up the 3 tiny steps on this children’s slide. The green handrails are perfect for her to hold onto while she works out how to get her legs into position. 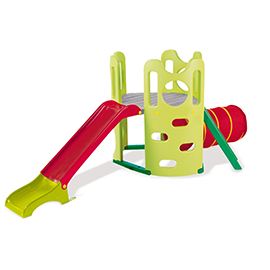 The slide is nice and sturdy and seems to be very well made. So far we have been keeping it in the living room as it doesn’t take up too much space and it’s nice for Sophia to have access to it all the time. Eventually we’ll probably keep the slide outside as it will be ideal as an outdoor toy on hot days. Surprisingly, this children’s slide is even helping with Sophia’s language development! She seems to be very inspired by the fact that it’s blue, and says “Blue, slide” (ok, “Boo-oo, sssss”!) every time she uses it! 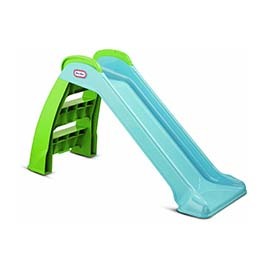 The prices for this children’s slide seem to vary from month to month – when Sophia’s Gran bought this for her in June 2013, it was just £29.99 which is really cheap. I think this is fantastic for a children’s slide of this quality.